For more than a week this summer, three bouquets of flowers graced my kitchen; one compliments of my cousin who came to dinner, and two from the Weavers Guild annual Volunteer Appreciation event. I felt very honored that three people nominated me for a volunteer of the year award, mostly because I constantly worry about all the things I could be doing, if each day included many more hours. I won a second award, for the most volunteer hours logged — but that one made me feel sheepish. I know SO MANY Weavers Guild members who put in so much time and effort, and I feel like I won that award because Melba Granlund is the greatest Volunteer Coordinator. Within the last three months, Melba sent out two pleas for people to log their hours. Since I know that grant makers are impressed by high numbers of volunteer hours, and because I had been spending endless hours planning for the “Traditional Norwegian Weaving: American Reboot” exhibit at Norway House, I responded to Melba’s request. I won’t have that many hours next year! Below is the blog post from the Weavers Guild website, which includes a Q & A about my background and weaving. WGM Peer-Nominated Volunteer of the Year: Robbie LaFleur! Congratulations to Robbie LaFleur who was nominated by not just one but THREE of her peers! This award was intended for those in the WGM community to have an opportunity to recognize a volunteer who went above and beyond in the past year. We received many nominations (thank you for your submissions!) but the most nominations went to Robbie and the WGM volunteer/outreach and membership committees confirmed this nomination. Thank you Robbie for your extraordinary service! WGM was happy to celebrate her many contributions at the 2017 WGM Volunteer Appreciation Reception held August 8, 2017 at Moscow on the Hill. We asked Robbie a few questions… enjoy! Tell us about you. How did you find weaving? I took classes at the Weavers Guild while I was in college at the University of Minnesota and the Guild was in Dania Hall on the West Bank. After college I attended Valdres Husflidsskole in Fagernes, Norway, for a thorough grounding in Norwegian weaving techniques. I wove throughout my career with the Minnesota Legislative Reference Library. My daughter’s childhood memory is that her attempts to sleep in on Saturday mornings were disturbed by the banging of the loom. When did you join WGM? How did you find out about WGM? I don’t remember when I joined—a long time ago. In my earlier children/career years, I was not so active. What type of weaving do you like to currently do? Tapestry and boundweave techniques. Currently I’ve been working with danskbrogd, a boundweave variant. And rya—I have a rya with indigo-dyed yarn in the planning stages. Every once in a while, I feel compelled to make a rag rug. Are there other practices you’d like to try/learn more about? I plan to try the wool transparency technique of Frida Hansen this winter, and go back to more exploration of transparency technique on a linen background, too. I have an idea that I would like to weave my grandmother, life-size. Also, I’m developing a course in billedvev (Norwegian tapestry) and accepting more opportunities to teach and lecture. Everywhere: Museums, paintings, photos, random designs created by shadows on a sidewalk, traditional folk symbols, the latest news. As a farmer’s daughter from northwestern Minnesota, I am working on farm field and equipment imagery. Who are your favorite weavers? Dead list: Two of the major 20th century Norwegian weavers—Hannah Ryggen for her freedom in design and political commentary; and Frida Hansen for the beautiful patterning in her designs and her unique wool transparency technique. Lila Nelson for her fearless experimentation in technique and her generosity of spirit. Märta Måås-Fjetterström, because I would love to make rugs like her. Living List: Aino Kajiniemi, the Finnish magician in thread. Helena Hernmarck. Also my favorite weavers are those who exemplify the “I can figure that out” attitude that I admire. At the risk of missing many other friends, I appreciate Jan Mostrom, Phyllis Waggoner, and Kala Exworthy. Why do you think weaving and creative makers are important? The world would be a bleaker place if all textile artists gave it up, turning in fiber for paints and just buying practical textiles ready-made. There is too much to be said, artistically, through the medium of textiles. There is too much joy to be distributed through textiles that are lovingly made. My friend Heidi Goldberg once wrote an article for The Norwegian Textile Letter, “Transforming Through Tradition: Teaching Nordic Arts at Concordia College, Moorhead.” I always think of her observation: “There are many students who have never worked on projects requiring facile hand skills unless it involved a computer keyboard.” Teaching weaving is important. I like the fact that weaving can be an artistic and an intellectual pursuit. For me, weaving and research about weaving has become a link to people, locally and internationally. Why do you volunteer at WGM? What has been your biggest contribution/impact in your view? My biggest contribution has been merely to bring together people to learn from and be inspired by one another. And through writing about classes and Guild activities, and working with exhibits, I like to bring attention to the work of weavers. Do you have any words of wisdom for beginning weavers? Don’t worry if you feel like you have to invent the wheel several times over. Many times I look at pieces I wove many years back, and think, “I wonder how I ever did that….” Take classes. Even if you don’t end up pursuing a particular technique, you will inevitably gain weaving wisdom from your instructor and your fellow students, and be inspired for whatever type of weaving you end up doing. Participate in Weavers Guild interest groups—and don’t worry, you don’t have to go all the time. Anything you’d like to tell your peer nominators? Robbie LaFleur is a Minneapolis weaver, editor, and writer. She has a BA in Scandinavian Studies and an MA in Library Science, both from the University of Minnesota. As the former director of the Minnesota Legislative Reference Library, she spent 29 years serving the Legislature, including the organization, promotion, and digitization of Minnesota state documents. Robbie weaves primarily contemporary textiles inspired by Norwegian coverlets and tapestries, and was awarded the Vesterheim Gold Medal in weaving in 2006. 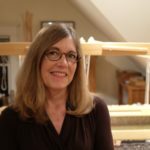 She coordinates the Weavers Guild of Minnesota Scandinavian Weavers Study Group, publishes the quarterly Norwegian Textile Letter, and is the copy editor of the American Tapestry Alliance publication, Tapestry Topics. As the current Communications Committee co-chair, she is committed to building connections by sharing the stories and accomplishments of talented WGM members. Congratulations on your honor! I so enjoyed the Q&A. I heard you speak at an Iowa Federation meeting at the Vesterheim many, many years ago. I wasn’t weaving very much at that point in my life, but you made it so interesting and fun. 🙂 Someday I hope we meet again!